When I walk along the edge of Lake Ontario and see little boys tossing pebbles into the water it always brings me joy. My own little boy did that once, drawn inexorably toward the shoreline and delighted by the rings he created as they moved ever outward. We smile at their efforts to make a mark on a great body of water, but little children understand something that the rest of us forget. 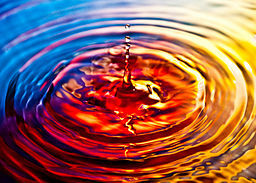 The first lesson of ripples is that the only moment that any of us will ever have is right now. We sense this when we crouch beside children to see the shiny new world through their eyes. Now is the dividing line between the past and the future, between desire and fulfillment. Every pebble we toss, every decision we make happens on that frontier between our intentions and our actions. As soon as we toss the second pebble we see that interesting things happen where two worlds collide. The border where the sea meets the shore supports tremendous biodiversity and in science, intersections like this hold important lessons. The interactions between industrial scale monoculture, genetic engineering and chemical pesticides are having a devastating impact on the living earth. We are only beginning to see the connections to mammalian health and there are even deadlier interactions connected to the burning of fossil fuels. Corporations profiting from genetically modified seeds were allowed to be responsible for safety testing but their methodology was, unsurprisingly, inadequate. Longer term studies have now been released that are cause for concern. I am now trying to process the understanding that my child, for most of his life, has been used by transnational corporations as a science experiment without my knowledge or consent and that despite my effort to end it, this experiment continues, because I don’t buy groceries at his father’s house, or the school cafeteria. The more pebbles you toss into the pond, the more complex the ripples become. There are bound to be some messy interactions between the ripples created by different groups and we need to allow for this while understanding that although our goals may differ in their specifics, we all share the same fundamental needs for clean air, water and non-toxic food. The politics of division is incredibly corrosive, and it threatens the very biosphere when it fragments opposition to ecocide. Whether people stand behind the Idle No More protesters as settler allies, or march against GMOs as fellow earthlings or Terrestrials, it is the joining in a common purpose that will tip the balance of power away from oppression and exploitation and towards justice and sustainability. Some people think the living earth is a sentient being, but whether Gaia has consciousness or not is a moot point if we argue about how many angels can dance on the head of a pin while ignoring the transnational corporations that are destroying the biosphere we need to survive. We are all on the same side in our need for air, water and food. Ripples begin from point at which the pebble falls and travel at their own speed. Although it is inevitable that trolls will try to sow conflict by trying to find differences between the indisputable needs of First Nations’ communities and the sympathetic desire of Settler Allies for a better world for all of our grandchildren, I think we are all bright enough to recognize and reject any false narrative that attempts to weaken our shared momentum. We all need to begin where we are. Settler Allies are not equally educated or aware of indigenous issues, and this isn’t going to change overnight. My lack of in-depth understanding of the historical issues should not preclude my participation as long as I recognize and respect First Nations moral authority and sovereignity in events that they organize. Settler allies’ understanding of the importance of dismantling the oppressive colonial power structures will grow over time, and gradually spread outwards throughout the wider community. Patience and understanding will help this process unfold. Once they start, ripples keep going and cannot be stopped. Years ago I would watch my son sleeping and unconsciously match my breathing to his. My love for him and the primal instinct to protect was a powerful and transformative force. When I became a mother my circles of concern and compassion expanded outward to take in other children not born into the privileged life my son enjoys. News stories of abuse and neglect that make everyone sad, seemed suddenly to cut much deeper. The protective instinct a parent feels is a powerful, primal thing. No matter what other roles I may adopt, I am a mother first, and that means I would stop a bullet for my child. While the threats to our childrens’ health are widespread and numerous, I am not going to back down just because the problem I’m trying to solve is massive and intractable. It is no surprise that Idle No More movement has risen on the shoulders of indigenous women. Mothers Against Drunk Driving made a real difference because they have an unassailable moral authority. Mothers of children everywhere are struggling against the corrosive power of transnational corporations and winning skirmishes on the ground in their own communities. These small victories send hope and courage rippling outwards to more families, friends and neighbours, increasing numbers of whom are finding it necessary to get off the couch to defend their communities as the tentacles of unrelenting corporate greed reach further into our daily lives. As a species, we are finally connecting the dots between the countless smaller battles being fought in communities around the globe. We are dropping pebbles into the same pond because the issues are interconnected. The campaigns of groups like Idle No More, Seed Freedom, and Occupy all have a fundamental purpose in common with Greenpeace and Amnesty International. Arab spring brought people from all faiths and walks of life into the streets to recognize their common cause, and we are seeing small groups of people in the west now coalesce in social media. There is a growing awareness that we are all on the same side, and the divide-and-conquer tactics of transnational corporations are losing traction. The pebbles of change will continue to drop and whether we march city streets, or meet at the blockades, we can all join hands and hearts in defense of the earth. There is a reason we are all drawn toward the shorelines of lakes, rivers and oceans to make ripples. It is the same thing that draws us to the barricades to make waves. The place where two worlds meet is where the tide turns and ripples begin to spread outward. This connection is where the magic happens. Posted on November 5, 2013, in Revolution, Terrestrialism and tagged activism, Amnesty International, blockade, climate change, climate justice, democracy, ecocide, first nations, fossil free, frack off, fracking, Greenpeace, idle no more, indigenous, nature, resistance, revolution, Ripple effect, sustainability, terrestrialism, transnational corporations. Bookmark the permalink. Leave a comment.